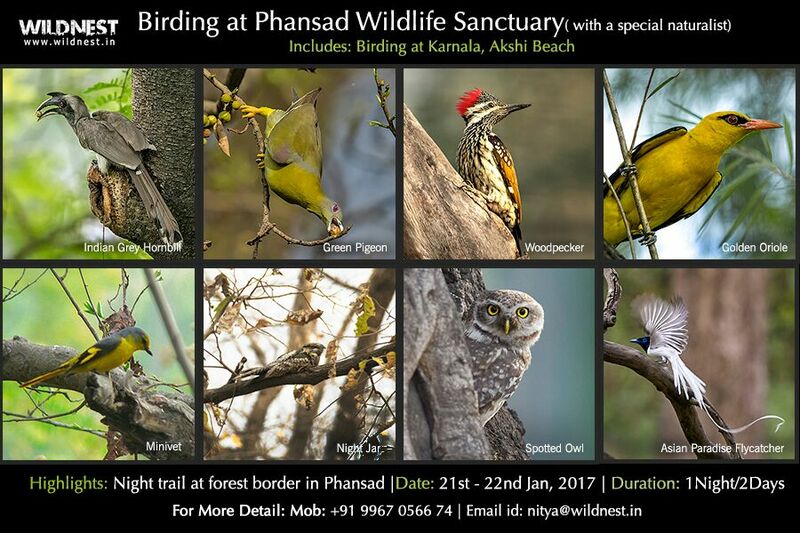 Located about 140 kms from Mumbai, Phansad is a great getaway for birdwatchers and photography enthusiasts. It used to be a part of hunting reserve for kingdom of Murud Janjira…. Home to rich fauna such as leopard, hyena, Indian giant squirrel, sambar deer, mouse deer etc.. and avifauna such as orioles, woodpeckers, nightjars, owls, minivets, green pigeons, eagles, grey hornbills, leafbirds, flycatchers and the rare Srilankan frogmouth etc, its a good wildlife destination in Western Ghats. Depart for Akshi/ Nagaon. Reach and have lunch. Late afternoon shore birding at Akshi beach and leave. Reach supegaon village at the outskirts of Phansad Wildlife Sanctuary by 6 pm.. Relax for an hour followed by early dinner. At 9 pm, leave for night trail along the forest border where one gets an opportunity to explore unique nocturnal birds and insects….. Note: A customised trip can also be planned subject to the availability of the naturalist.